One sunny day in June 2018, Tyson sat in a prison cell in the middle of Old Market Square. While passersby expressed shock to see him there, Tyson was eager to get the message across: the province’s care system has locked him out of his own life. For three years, Tyson has been dealing with the aftermath of losing services after high school. When he was in school, he led an active lifestyle and dreamt of going to university to study computer science. He enjoyed a busy social life and spent time connecting with others online. After graduating, his life took a sharp turn. Tyson had to return the screen reader he had been given to access the computer, not only for leisure but also for necessities like online banking. Instead of going out every day for school and social activities, Tyson found himself stuck at home without a support worker to assist him in going out. The only service he qualifies for is home care, which is capped at 55 hours each week. Home care involves only basic support with things like bathing, clothing, medical prescriptions, and warming up food and laundry. It doesn’t involve any kind of assistance outside the home. The home care hours are so limited that Tyson sometimes had to choose between necessities like breakfast and laundry. 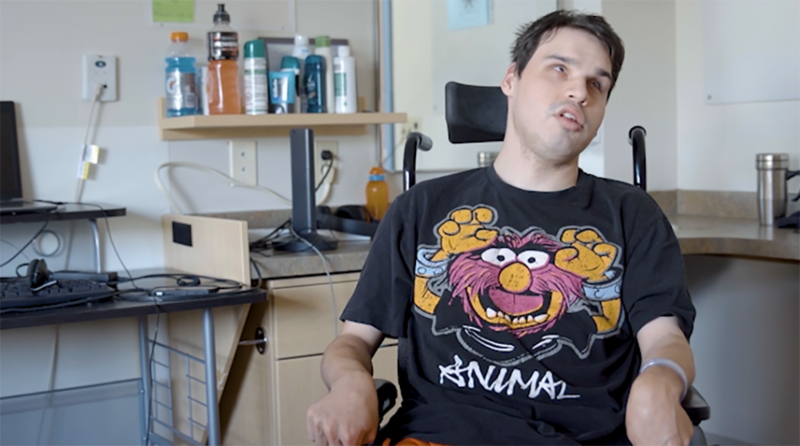 Because Tyson felt unsafe without the necessary supports, he recently moved to a personal care home in Winnipeg. When he was younger, Tyson was able to live his active lifestyle with the support of a personal care worker who assisted him in going out and attending social events. Now, stuck at home, Tyson is feeling the loneliness of an extrovert surrounded by four walls. That is why he took his experience to the public on that day in June. Tyson is driven by the hope that this campaign will change things for him and other individuals with physical disabilities in Manitoba. No one should lose services that have allowed them to thrive. No one should be locked out of their life.